Anchor Cynthia Izaguirre introduced reporter Bradley Blackburn’s package in a wide shot of the station’s Victory Park studio, which the station refreshed back in May 2018. 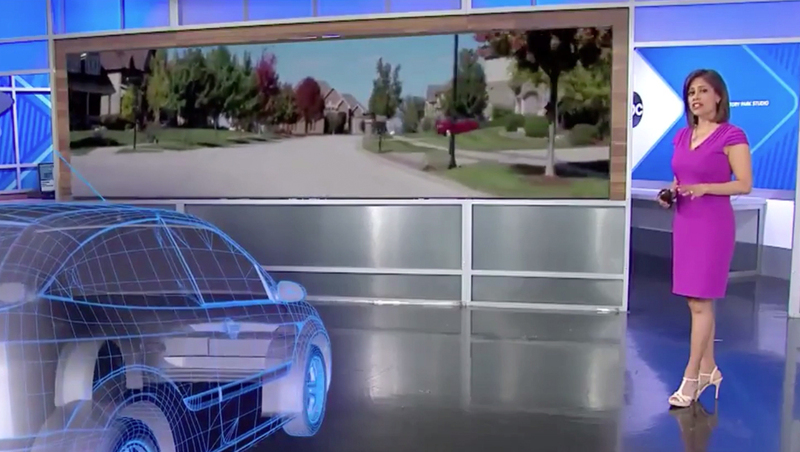 As a video clip taken from a car driving around a residential neighborhood appeared on the set’s video wall, a wireframe and rough 3D model of a car “drove” on the studio floor next to Izaguirre. When Izaguirre mentioned that speed limits such as 30 mph could be lowered to 25 mph, virtual speed limit signs appeared to “pass by” the car.